We’re welcoming spring with the latest edition of The Buzzer. 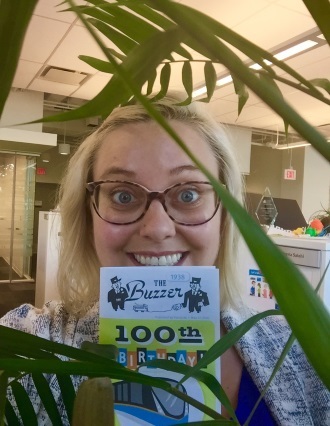 I Love Transit Week is just around the corner, which means you can now find the corresponding annual special edition of The Buzzer on the system! Welcome spring—and welcome to 2018’s first print edition of The Buzzer. This issue is dedicated in part to our annual Spring Service Changes, which include popular seasonal changes and a big change to community shuttle routes! Stay tuned for upcoming Bus Route Buzz posts for a more in-depth look at everything Spring Service Changes. Remember! 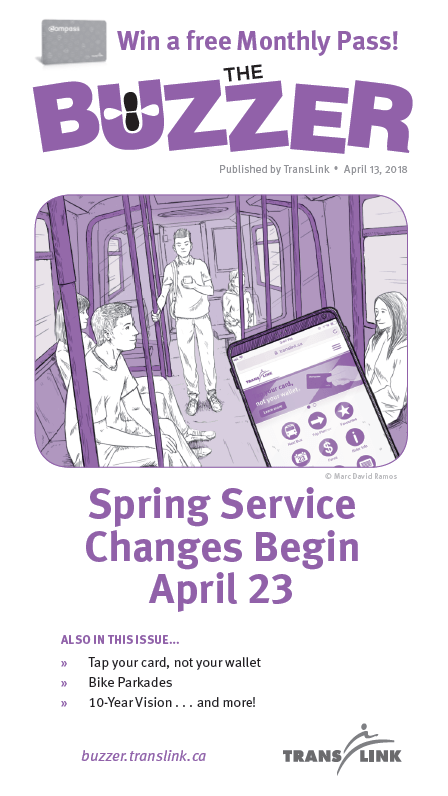 Service Changes begin Monday, April 23, 2018. In this issue, we also go full steam ahead with a funding plan for Phase Two of the 10-Year Vision, take a look at the all new Metrotown Station, and remind you to tap your card, not your wallet! As always, catch our favourites – Contest Corner, Back Issues and Coming Events! Pick up your copy today on the bus, SkyTrain, SeaBus and West Coast Express, or download the PDF from our website. The December 2017 edition of the print Buzzer was illustrated by the talented Jenny Hsieh, who we originally discovered through her super fun Instagram account. 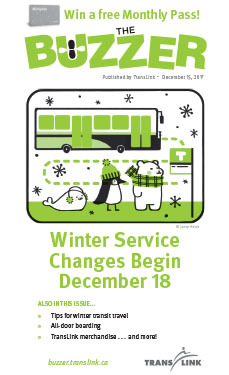 Jenny’s adorable winter clad creatures don the cover in promotion of winter service changes, all-door boarding, TransLink merchandise, and more! We asked Jenny a few questions to learn a little more about her as an illustrator. I am a freelance illustrator based in Vancouver. I recently graduated from Emily Carr University with a BFA in Illustration. When I’m not drawing I’m liking cute dog photos on Instagram. What gets you inspired when you’re creating? I get my inspiration from everyday life. I like to take seemingly banal moments and illustrate them in a way that makes them extraordinary. What are your favourite subjects to illustrate? I enjoy drawing people and dogs (especially shiba inus). Tell us about your illustration for the latest print Buzzer? My illustration features three warmly dressed animals waiting for the bus. I wanted to illustrate something simple and fun to represent bus schedule changes in the winter season. What are your artist tools of choice? I like to switch between various mediums. I mainly use Adobe Photoshop or Illustrator for my digital work, and watercolour, ink, or coloured pencils for my traditional stuff. I like exploring different mediums since each one can really lend to the mood of a work. What has been some of your favourite projects you’ve created? Recently, I made a zine consisting of ink drawings that I created in October. It’s basically cute girls in cute outfits – it was a lot of fun to draw! What are some of the fun projects you’re working on now? Right now, I am trying to put together another zine/comic. I am also working on opening an online store, which will probably be ready early next year. You can stay updated with me on my instagram and website! My favourite and most frequent mode of transit is definitely the SkyTrain. I’ve spent most of my time on the SkyTrain because of school. It just makes travelling downtown so convenient! Do you have any fun plans for winter? Yes! Winter vacation plans included spending Christmas and New Year’s in Taiwan. A huge thanks to Jenny for creating such a great illustration for our print Buzzer! We wish you well in your future art projects! 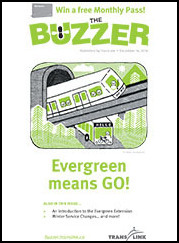 Grab your copy of The Buzzer on SkyTrain, SeaBus, West Coast Express and buses before they’re gone or download it here. Interested in becoming an illustrator for The Buzzer? Shoot us an email at thebuzzer@translink.ca. Happy holidays! The December 2017 print Buzzer is now on the system. This season’s issue is dedicated in part to Winter Service Changes as well as tips for winter transit travel to keep you on the go! Make sure to watch out for our upcoming Bus Route Buzz posts for a more in-depth look at our seasonal service changes. Remember! Service Changes begin Monday, December 18, 2017. In this issue we introduce all-door boarding to the 95 and 96 B-Line buses and remind you how you can take transit home! As always, we have our favourites – Contest Corner, Back Issues and Coming Events! Pick it up today on the bus, SkyTrain, SeaBus and West Coast Express or you can download it here. 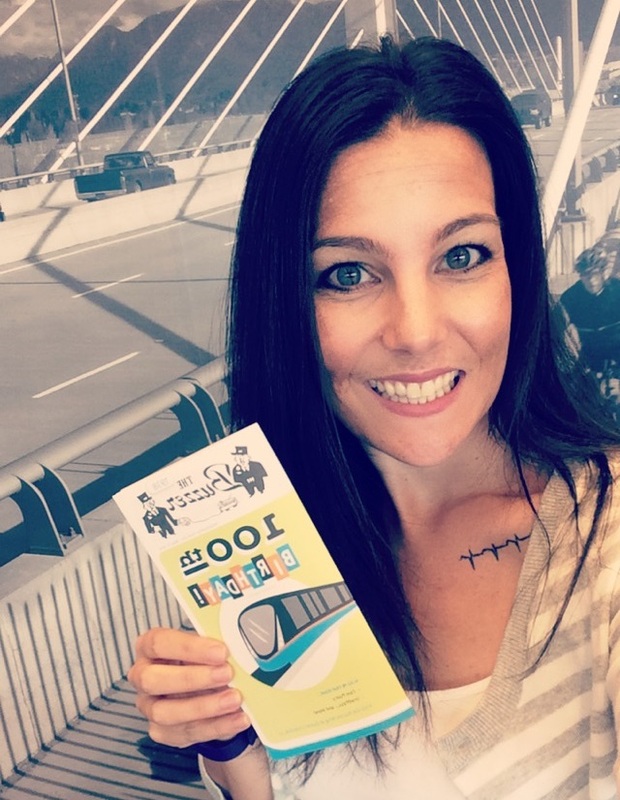 I Love Transit Week is here again, and so is the annual special edition of The Buzzer! This September edition of the print Buzzer illustration was done by Honeylyn Amaga. Celebrating the largest bus service increase as part of the 10-Year Vision, Honelyn features a smiling happy bus eager to help move Metro Vancouver! We asked Honeylyn a few questions to learn a little more about her as an illustrator! I was born and raised in Cebu, Philippines where I worked as a Registered Nurse. I recently became a Licensed Practical Nurse in B.C., however my real love is art! I’ve been interested in art since high school, and competed in many art competitions. A few months ago, I rekindled my love of the arts through picking up my some canvas to craft portrait and landscape paintings. As an artist, I’m inspired by many things. Internally, I’m driven by the emotions and passion that I feel towards a piece. Family in Cebu and Canada are also very inspirational to me. Lastly, I’m inspired by other famous artists such as French impressionist Claude Monet, and Dutch painter Vincent van Gogh. I really love nature and portraits. I typically work with traditional mediums like paint and canvas, however I love new challenges and am continually learning about illustrating in the digital and graphic space. Tell us about your illustration for the latest print Buzzer. Fall Service Changes were the biggest in nearly a decade, so this illustration focused on the bus as the main subject. The smiling bus represents the staff at Translink who are happy to serve bus, SkyTrain, SeaBus and West Coast Express passengers. The colourful lines underneath the bus depict “more moving, less waiting” as part of the 10 year Vision. What are your artistic tools of choice? Generally I prefer painting with acrylics, canvas boards and brushes, however when working digitally I love using Adobe Illustrator. What have been some of your favourite projects you’ve created? The print Buzzer of course! This has so far been the biggest leap of my career as an artist. I love painting portraits of people as it is very rewarding to see their satisfaction with the finished works I create. As you can probably tell from my illustration, I love taking the SkyTrain and the bus. When riding the SkyTrain I often find myself deep in thought especially if there’s an eye catching view of nature out the window! I’m currently working on some canvas portraits, and will be participating in the Vancouver Art Battle on September 21, 2017. Do you have any fun plans this fall? Aside from the upcoming Vancouver Art Battle, each September my husband, my son and I celebrate our wedding anniversary with a getaway to Tofino! 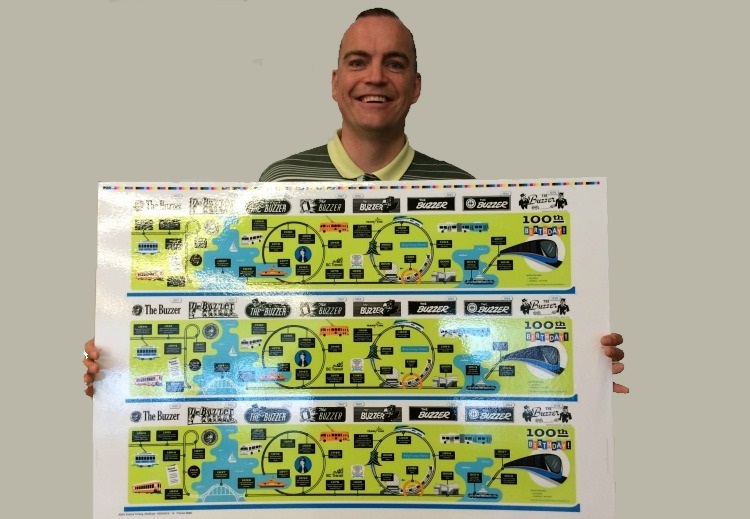 Thank you Honeylyn for creating such a great illustration for our print Buzzer! We wish you well in your future art projects, and of course, Happy Anniversary! Happy holidays! The December 2016 print Buzzer is now on the system. Much of this issue is dedicated to Winter Service Changes. This sheet change is especially important because of the newly opened Evergreen Extension. Be sure to check out Bus Route Buzz for more information about changes to service around the Tri-Cities. Remember! Service Changes begin Monday, December 19, 2016. Also in this issue we introduce our beautiful new SkyTrain extension!! Happy reading! Pick it up today on the bus, SkyTrain, SeaBus and West Coast Express or you can download it here.